The most important part of Valve’s stunning VR demonstration at GDC wasn’t the headset. I think that, in a blind test between the HTC Vive and the current version of the Oculus Crescent Bay developer kit, you’d struggle to tell the difference. Want to know what to play first? Check out the best VR games on PC. What mattered was the controller, and the two black boxes that make it work: the lighthouse. Combined, they create the most convincing, mind-bending, hilarious and emotional presentation of the future of games I could imagine. Valve have built a holodeck. It’s exactly as good as you think it is. 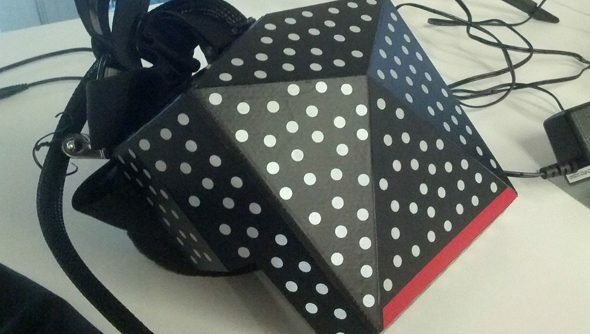 Valve’s VR innovation comes in two parts. The controller is the first; shaped somewhere between a sword hilt and a Wii-mote. They’re concave, bending towards the player in the centre. They have a trigger, and the grip is also a button. Where your thumb rests within the curve sits the same haptic thumbpads that are found on the Steam Controller. They’re intelligent, too: able to detect motion and position themselves within a space. They know where they are thanks to the base-stations. The base-stations fire a grid of infra-red light across the room, in the vertical and horizontal axis. Sensors within the controller’s hilt use that light grid to figure out exactly where they are within the VR area. The second part: your legs. Whereas Oculus are pushing for a “seated experience”, Valve want you to get up and move around. Their headset is still wired (currently, Valve pass the wires behind your head, down your back, through a belt loop and onto the floor. In their setup, you build a VR safe-space: clear some room within your house or flat, move some furniture out of the way, strap the cat down (possibly). If you want to play Valve’s VR, you going to have to put a room to one side. With the headset and headphones on, the software demo opens in a white room – the boundaries of the available space gently visible as grey lines marked out on the floor. You’re free to move and walk around as you see fit but, as you approach the edge of the safe area, further grey lines appear within the walls. It is today’s version of what everyone who lives and works on 24th Century space-ships understand: you shouldn’t get too close to the walls of the Holodeck. The demo opened with a guide, in this case a nice man called Bill, handing over a pair of controllers, and asking me to pull the trigger. A balloon inflated right from my fingers. It’s hard to articulate just how quickly even that simple demonstration fooled my brain. As the balloon meandered away, my first impulse was to bop it with my other hand. I felt a small, tactile little pulse, heard the slightly metallic thunk, and the balloon bounced away. It was mundane, simple, the kind of gentle play we’ve enjoyed thousands of times. But it felt real. I was no longer in a contrived demo space in a convention centre. I was somewhere else. Bill asked me to move to the pedestal. I didn’t: I wanted to play with more balloons, inflating them repeatedly, bopping each one away; entranced. “We’ve had people spend hours playing with the balloons,” says Bill. Bill asked me to look at the floor. It was covered in hexagonal white tiles that raised and fell – a science-fiction Giants Causeway. As I walked towards them, they stopped moving, guiding me towards a pedestal in the centre of the room. The demo proper was about to begin. I want to make a small point. I thought, given that I was being asked to move around a space in which I could neither see nor hear what was going on in the ‘real’ world, to be nervous. Scared. But the illusion was so complete, I felt zero trepidation. Valve’s VR demonstration consisted of a series of three minute demos, mostly created by some of Steam’s most successful indie studios. There’s a demo in which you perch on the prow of a sunken ship, and a whale the size of a bus flaps its flippers at your face. It is “woah”. There is a demo where you watch tiny little men on horses run across a table-top, while aeroplanes and cannons and tanks fight back. It is a miniature little siege. Absolutely entrancing. There is a hex-game, again set on a table-top, in which you point your controllers at each tile like a magic wand, picking your options as if out of a magic book. It is adorable. They are all great, stunning examples of what the headset is capable of doing. Putting you in a place and making you interact within it. Then there are pieces of game and experience design that left me speechless. There is a remake of The Room, an iOS puzzle game. In this version, stepping up to a different corner of the VR space changes what’s in front of you. In one area, a globe, that opens up to reveal a problem. In another, a drinks cabinet. Another, a corpse. There is a mystery to solve: the space reconfiguring as you work your way through. Again, like I said earlier: despite the very unreal situation – corpses popping in and out of reality, my brain wasn’t wobbling. Sure, it made me jump: I defy anyone not to be startled when a rotting corpse appears where previously you’d been searching a cupboard for ancient gin. Just take a moment to take that in. Surgeon Simulator, played in VR, with two magic controller things that let you pick up saws and hammers and laser drills and a pair of pincers. The VR demo of Surgeon Simulator is the silliest slice of videogames I’ve ever played. No question. Set on Mars, in lower gravity than you’re used to, performing a brutal autopsy on a wobbly limbed grey, as chunks of bones and exo-goo are floating around your head goes beyond ludicrous. It is a new level of absurd. It is spectacularly, awesomely, mind-bendingly funny. There’s a demo of a new game set in Aperture Science. Note: it’s not Portal in VR. The Aperture Science demo is a perfect demonstration that Portal in Valve’s special walk-around VR rooms probably couldn’t work. If you’re going to create a walkable VR space, you need to limit the playable area. Players can’t be expected to walk through a hole on one side of the room and re-appear on another. Valve have not invented a teleportation device. Yet. Instead, the Aperture Science demo demonstrates how the playable area can be relentlessly reconfigured around a player, delivering new challenges. First you arrive within a small storage room. After rooting through some drawers, Atlas, the circular co-op robot from Portal 2 is unceremoniously shunted into the room, requiring repair. He is disassembled: you’re asked to use the controller to fiddle and spin with his innards until he (inevitably) falls apart. Then, the walls are removed and replaced by Aperture Science’s industrious mechanical arms, the floor pulled out from underneath you as you scurry to a safe corner. Glados appears, peering at this strange little human in a virtual reality helmet. At no point do you have to hurtle through a Portal. At no point do you ever leave the boundaries of your little VR area. You don’t move. The room relentlessly refreshes itself. Portal was the final demo in the loop, but it wasn’t the best. The game I keep returning to, the experience I can’t wait to repeat, wasn’t really a game. It was an art package in which you use the controllers as a paint brush and pallete: drawing coloured lines in the air which you can then walk around. Like light painting, or drawing shapes with a sparkler. In a few seconds, I’d drawn a little hobbit house in one corner, with a child sized door and windows. In another, I painted a looming, eight foot tall stick man. It’s a simple, but moving idea. Bill explained that players would be able to collaborate on their drawings; watching each brush stroke, and then adding their own marks. It’s a beautiful idea: I get a little emotional thinking how much fun I could have with my kids making silly VR works of art. The paint demo proves another point. VR technology is a means to an end: that it’s the experiences developers create that will actually matter. Valve’s VR setup is unusual: it requires investment beyond a headset and a PC. It is going to require some thought to create a space. You are going to want to think about hardware purchases beyond a PC with a decent CPU and GPU: assuming that you want this experience, you’ll want a quiet PC that you’re happy to keep in a living or family room. You will want to figure out where you’re going to place a pair of base-stations, and how to best keep the wires from the headset out from under your feet. It may not be practical for everyone. Game designers face new challenges. For decades, we’ve been moving towards big open-worlds, been pushing players to trek through corridors full of space-aliens. Valve’s solution asks us to play in a confined, smaller space. It may be that the best games of the future will be partly based on children’s TV. I’ve been a gamer all my life. I’ve been playing PC games since I was practically a foetus. The fifteen minutes I spent in Valve’s VR demo was the best time I’ve ever had playing games. And all I can think about is how I can play it all again.